“USDOI” redirects here. For the precursor to the FBI, see United States Division of Investigation. For the statement, see United States Declaration of Independence. 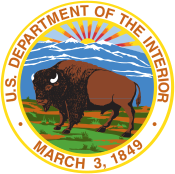 The United States Department of the Interior (DOI) is the United States federal executive department of the U.S. government responsible for the management and conservation of most federal lands and natural resources, and the administration of programs relating to Native Americans, Alaska Natives, Native Hawaiians, territorial affairs, and insular areas of the United States. About 75% of federal public land is managed by the department, with most of the remainder managed by the United States Department of Agriculture‘s United States Forest Service. The department is administered by the United States Secretary of the Interior, who is a member of the Cabinet of the President. The current Secretary is David Bernhardt, who serves in an acting capacity, and concurrently serves in the Department as Deputy Secretary. The Inspector General position is currently vacant, with Mary Kendall serving as acting Inspector General. The Department of the Interior has often been humorously called “The Department of Everything Else” because of its broad range of responsibilities. A department for domestic concern was first considered by the 1st United States Congress in 1789, but those duties were placed in the Department of State. The idea of a separate domestic department continued to percolate for a half-century and was supported by Presidents from James Madison to James Polk. The 1846–48 Mexican–American War gave the proposal new steam as the responsibilities of the federal government grew. Polk’s Secretary of the Treasury, Robert J. Walker, became a vocal champion of creating the new department. In 1849, Walker stated in his annual report that several federal offices were placed in departments with which they had little to do. He noted that the General Land Office had little to do with the Treasury and also highlighted the Indian Affairs office, part of the Department of War, and the Patent Office, part of the Department of State. 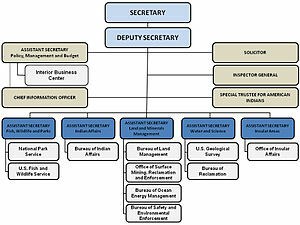 Walker argued that these and other bureaus should be brought together in a new Department of the Interior. A bill authorizing its creation of the department passed the House of Representatives on February 15, 1849, and spent just over two weeks in the Senate. The department was established on March 3, 1849 (9 Stat. 395), the eve of President Zachary Taylor‘s inauguration, when the Senate voted 31 to 25 to create the department. Its passage was delayed by Democrats in Congress who were reluctant to create more patronage posts for the incoming Whig administration to fill. The first Secretary of the Interior was Thomas Ewing. As of mid-2004, the department managed 507 million acres (2,050,000 km²) of surface land, or about one-fifth of the land in the United States. It manages 476 dams and 348 reservoirs through the Bureau of Reclamation, 410 national parks, monuments, seashore sites, etc. through the National Park Service, and 544 national wildlife refuges through the Fish and Wildlife Service. Secretary of the Interior Albert B. Fall was implicated in the Teapot Dome scandal of 1921. He was convicted of bribery in 1929, and served one year in prison, for his part in the controversy. A major factor in the scandal was a transfer of certain oil leases from the jurisdiction of the Department of the Navy to that of the Department of the Interior, at Fall’s behest. Secretary of the Interior James G. Watt—already facing criticism related to his alleged hostility to environmentalism and his support of the development and use of federal lands by foresting, ranching, and other commercial interests, and for banning The Beach Boys from playing a 1983 Independence Day concert on the National Mall out of concerns of attracting “an undesirable element”—resigned abruptly after a September 21, 1983, speech in which he said about his staff: “I have a black, a woman, two Jews and a cripple. And we have talent.” Within weeks of making this statement, Watt submitted his resignation letter. ^ “About the Inspector General”. U.S. Department of the Interior. Retrieved 16 July 2015. ^ “Oversight: The Office of the Inspector General for the Department of the Interior”. Committee on Natural Resources. Retrieved 16 July 2015. ^ “History”, National Park Service web page. Retrieved 2010-05-20. ^ Curtis, Mary C., “Obama Hails Passage of Settlement for Native Americans, Black Farmers”, The Huffington Post, 30 November 2010. Accessed 1 December 2011. ^ Warren, James, “A Victory for Native Americans?”, The Atlantic, 7 June 2010. ^ a b 556. James G Watt, US Secretary of the Interior., “Simpson’s Contemporary Quotations” (1988) via bartleby.com and Wayback Machine. ^ “Bush legacy leaves uphill climb for U.S. parks”, Los Angeles Times, January 25, 2009.